The Pacific Coast League made a cameo appearance in Upstate New York on Thursday afternoon, as Buffalo's Jim Negrych hit for the International League's first cycle of the season in the Bisons' wild 27-9 win over host Syracuse. A 19-mph wind blowing out to left helped the two teams combine for 43 hits and seven home runs. The International League's single-game records only go back to the 1973 season, but Buffalo's 27 runs and 29 hits are the most on the circuit in those 41 seasons. Since 2005, the most runs scored by an IL team was by today's victim, Syracuse, which scored 23 on July 16, 2006 against Richmond. The Bisons also set or matched a host of modern-era records, both individually and as a team. Buffalo's 27 runs eclipsed the previous record of 25, set in a 25-13 win at Rochester on April 29, 2004. Its 29 hits surpassed the previous mark of 27, set in a 15-9, 10-inning win at Indianapolis on April 18, 1985. The Bisons' nine-inning record was 25 in the April 29, 2004, game. Buffalo manager Marty Brown also managed the team -- then an Indians affiliate -- in the 25-run 2004 game at Rochester. "Conditions today were a lot like they were in 2004," he said. "We had the same kind of wind and some strange things happened. "We have some talented, hard-working guys in this lineup and it's been great to see them produce no matter what the conditions." The Bisons also set a new mark for largest margin of victory (18), topping a 17-1 win at Toledo on July 17, 2012. Buffalo's 10-run seventh tied a club record that was first set in the third inning of a 14-0 win over Richmond on May 5, 2001. Negrych, a Buffalo-area native in his first season with the Bisons, led off the game with a triple to right and completed the cycle with a two-out solo shot to right-center in the sixth. Negrych finished the day 4-for-7 and owns an IL-best .515 average. "It was a pretty interesting game," Negrych said. "I'm not sure I've seen anything like that." Asked if any of the game's seven home runs seemed particularly wind-aided, Negrych laughed and said, "Probably mine, honestly. I knew I was a homer short when I came up [in the sixth], but I'm not a guy who hits too many -- I just happened to walk into one." Negrych began the game with 30 home runs and 15 triples in 696 career Minor League games over eight seasons. It was the fifth cycle in Buffalo regular-season history and first since Justin Turner managed the feat at Rochester on Sept. 6, 2010. All five Bisons cycles have come on the road. The last International League cycle was hit by Jason Donald in Columbus' 13-2 win over Charlotte on June 19, 2012. Negrych's cycle is the third in the Minors this season, following quickly on the heels of Tacoma's Carlos Triunfel, who completed the feat Wednesday night. 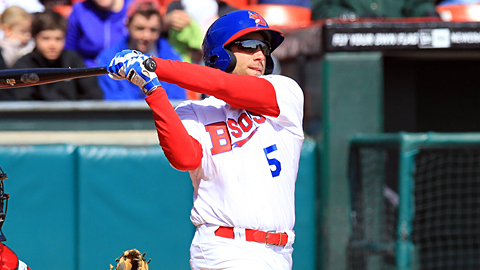 Of the Bisons' 29 hits, 13 went for extra bases, including five home runs. It wasn't just the wind, though -- after 12 games, Buffalo is hitting .333/.406/.531 with 85 runs, 16 homers and 212 total bases. The Bisons lead the IL in each of those categories. Buffalo right fielder Moises Sierra went 6-for-6 with a triple and a double; he came up three times needing a homer for a second cycle, but was unable to connect. In the ninth, Sierra's wind-blown popup fell untouched near the shortstop position for his sixth hit. Over the last 77 years, only two other Bisons have collected six hits in a game: Justin Turner in his cycle game in 2010 and Howard "Butch" Meyers on June 29, 1936. Both games were in Rochester. Since 1995, only two IL teams -- the 1997 Toledo Mud Hens (Andy Tomberlin and Frank Catalanotto) and the 2007 Louisville Bats (Anderson Machado and Chris Dickerson) -- have managed two cycles in a single season, let alone one game. Buffalo game up just short. Bisons first baseman Luis Jimenez drove in eight runs on a 5-for-7 day while left fielder Ryan Langerhans homered twice, doubled and collected six RBIs. Jimenez's eight RBIs tied for second-most in team history, falling one shy of Dusty Wathan's nine set against Toledo on June 2, 2005. The Bisons brought at least nine batters to the plate in four different innings -- 13 in the 10-run seventh -- and eight of the nine Bisons hitters had multiple hits and at least one RBI. Both Sierra and Langerhans scored five times; the only other Bisons player in modern history to score five runs in a game was Brett Abernathy at Indianapolis on June 19, 2004. Shortstop Ryan Goins went hitless in his first six at-bats, but delivered a two-out RBI double in the ninth to get in the hit column. The host Chiefs rapped out 14 hits of their own, with each Syracuse batter collecting at least one. First baseman Chris Marrero also had a shot at a cycle -- needing a triple, the Nationals' No. 12 prospect bounced out to short in the ninth to complete a 3-for-5 day. Micah Owings, a former big league pitcher working his way back as an outfielder, tripled, singled twice and drove in two runs for the Chiefs. A banner day for hitters meant pain for both pitching staffs, with neither starter making it past the fourth inning. Buffalo starter Edgar Gonzalez allowed five runs on eight hits over four frames, while Syracuse's Tanner Roark (1-2) surrendered 10 runs on 12 hits in 3 2/3 innings to suffer the loss. "We told the pitchers to just stay within themselves," Bisons manager Brown said. "Try to get ahead, keep the ball down, control the things you can control -- same as in any other game." Worst hit was Chiefs reliever Patrick McCoy, who gave up nine runs -- four of them earned -- while getting the first two outs of the seventh. Only Buffalo's Alex Hinshaw escaped fully unscathed, pitching a perfect ninth, although Syracuse's J.C. Romero did not allow a run despite giving up two hits before recording the final Bisons out. Bobby Korecky earned the win for Buffalo, improving to 2-0. The veteran right-hander allowed two runs on three hits and a walk while fanning one over three innings.